Your dog is hungry for adventure, but we’re betting he could go for a snack, too! Don’t forget our Chicken Recipe Protein Sticks when you leave home! With 80% chicken, this tasty protein stick is sure to satisfy your dog’s hunger while you satisfy his love for adventure! Easy to bring along for the trip, these individually-wrapped treats can easily be broken into smaller pieces, or served whole as a special grab n’ go snack! 80% of protein from animal sources. Slow-roasted in U.S. facilities to perfection. Chicken, Dried Ground Chickpeas, Sodium Alginate (casing), Gelatin, Salt, Salmon Oil, Mixed Tocopherols (as preservative), Vitamin E Supplement, L-Ascorbyl-2-Monophosphate (source of Vitamin C), Rosemary Extract, Coconut Glycerin, Dried Bacillus coagulans Fermentation Product, Organic Apple Cider Vinegar, Citric Acid (as preservative). FreeStyle Protein Sticks Chicken Recipe are intended for intermittent or supplemental feeding only. 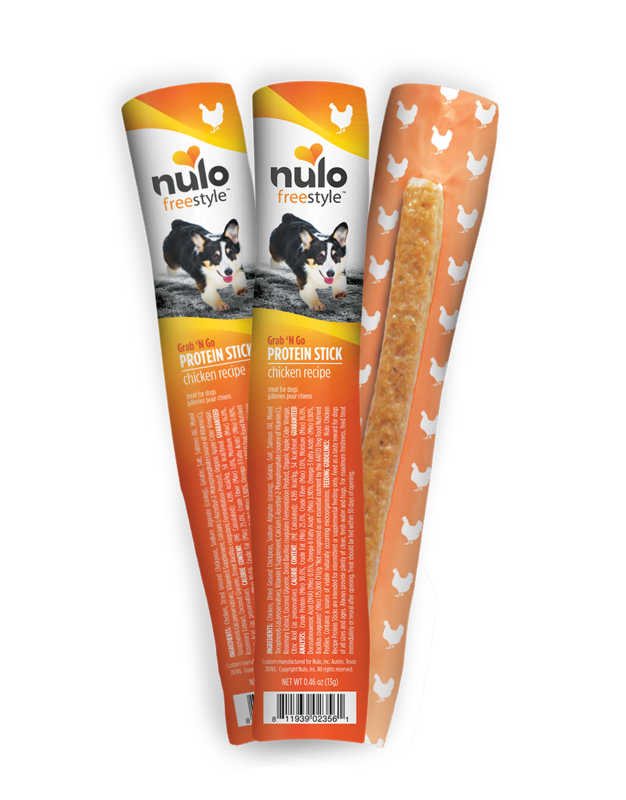 Nulo Protein Sticks are intended for intermittent or supplemental feeding only. Feed as a tasty reward for dogs of all sizes and ages. Always provide plenty of clean, fresh water and hugs. For maximum freshness, feed treat immediately or reseal after opening. Treat should be fed within 30 days of opening.